Most people know that Albert Einstein was a famous scientist who came up with the formula E=mc2. But do you know these ten things about this genius? When Einstein attended college at the Polytechnic Institute in Zurich, Switzerland, he fell in love with sailing. He would often take a boat out onto a lake, pull out a notebook, relax, and think. 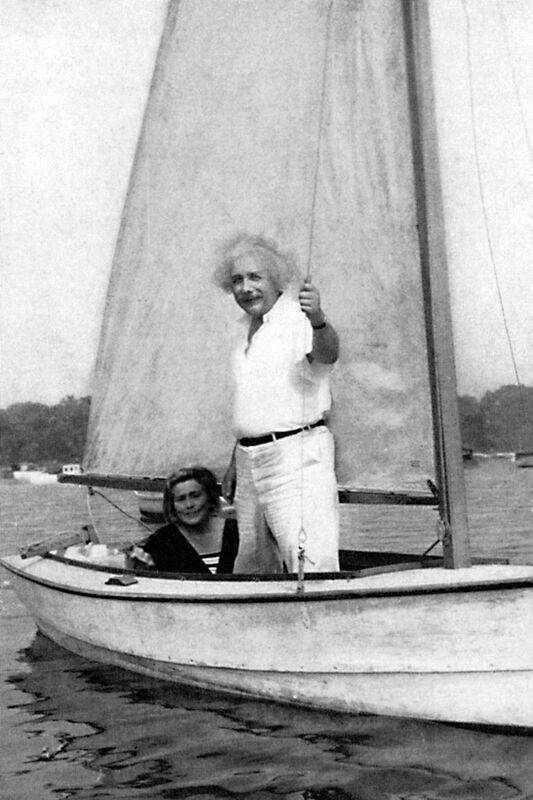 Even though Einstein never learned to swim, he kept sailing as a hobby throughout his life. When Einstein died in 1955, his body was cremated and his ashes scattered, as was his wish. However, before his body was cremated, pathologist Thomas Harvey at Princeton Hospital conducted an autopsy in which he removed Einstein's brain. Rather than putting the brain back in the body, Harvey decided to keep it, ostensibly for study. Harvey did not have permission to keep Einstein's brain, but days later, he convinced Einstein's son that it would help science. Shortly thereafter, Harvey was fired from his position at Princeton because he refused to give up Einstein's brain. For the next four decades, Harvey kept Einstein's chopped-up brain (Harvey had it cut into 240 pieces) in two mason jars with him as he moved around the country. Every once in a while, Harvey would slice off a piece and send it to a researcher. Finally, in 1998, Harvey returned Einstein's brain to the pathologist at Princeton Hospital. Einstein's mother, Pauline, was an accomplished pianist and wanted her son to love music too, so she started him on violin lessons when he was six years old. Unfortunately, at first, Einstein hated playing the violin. He would much rather build houses of cards, which he was really good at (he once built one 14 stories high! ), or do just about anything else. When Einstein was 13-years old, he suddenly changed his mind about the violin when he heard the music of Mozart. With a new passion for playing, Einstein continued to play the violin until the last few years of his life. For nearly seven decades, Einstein would not only use the violin to relax when he became stuck in his thinking process, he would play socially at local recitals or join in impromptu groups such as Christmas carolers who stopped at his home. A few days after Zionist leader and first President of Israel Chaim Weizmann died on November 9, 1952, Einstein was asked if he would accept the position of being the second president of Israel. Einstein, age 73, declined the offer. In his official letter of refusal, Einstein stated that he not only lacked the "natural aptitude and the experience to deal properly with people," but also, he was getting old. Part of Einstein's charm was his disheveled look. In addition to his uncombed hair, one of Einstein's peculiar habits was to never wear socks. Whether it was while out sailing or to a formal dinner at the White House, Einstein went without socks everywhere. To Einstein, socks were a pain because they often would get holes in them. Plus, why wear both socks and shoes when one of them would do just fine? When Albert Einstein was five years old and sick in bed, his father showed him a simple pocket compass. Einstein was mesmerized. What force exerted itself on the little needle to make it point in a single direction? This question haunted Einstein for many years and has been noted as the beginning of his fascination with science. Twenty-one years after writing his Special Theory of Relativity, Albert Einstein invented a refrigerator that operated on alcohol gas. The refrigerator was patented in 1926 but never went into production because new technology made it unnecessary. Einstein invented the refrigerator because he read about a family that was poisoned by a sulphur dioxide-emitting refrigerator. Einstein loved to smoke. As he walked between his house and his office at Princeton, one could often see him followed by a trail of smoke. Nearly as part of his image as his wild hair and baggy clothes was Einstein clutching his trusty briar pipe. In 1950, Einstein is noted as saying, "I believe that pipe smoking contributes to a somewhat calm and objective judgment in all human affairs." Although he favored pipes, Einstein was not one to turn down a cigar or even a cigarette. After Einstein divorced his first wife, Mileva Maric, in 1919, he married his cousin, Elsa Loewenthal (nee Einstein). How closely were they related? Quite close. Elsa was actually related to Albert on both sides of his family. Albert's mother and Elsa's mother were sisters, plus Albert's father and Elsa's father were cousins. When they were both little, Elsa and Albert had played together; however, their romance only began once Elsa had married and divorced Max Loewenthal. In 1901, before Albert Einstein and Mileva Maric were married, the college sweethearts took a romantic getaway to Lake Como in Italy. After the vacation, Mileva found herself pregnant. In that day and age, illegitimate children were not uncommon and yet they were also not accepted by society. Since Einstein did not have the money to marry Maric nor the ability to support a child, the two were not able to get married until Einstein got the patent job over a year later. So as not to besmirch Einstein's reputation, Maric went back to her family and had the baby girl, whom she named Lieserl. Although we know that Einstein knew about his daughter, we don't actually know what happened to her. There are but just a few references to her in Einstein's letters, with the last one in September 1903. It is believed that Lieserl either died after suffering from scarlet fever at an early age or she survived scarlet fever and was given up for adoption. Both Albert and Mileva kept the existence of Lieserl so secret that Einstein scholars only discovered her existence in recent years. Was Einstein's First Wife His Silent Collaborator?